What? You haven’t?? Holy Kohlrabi! Get thyself to a farmers market near you and pick up some kohlrabi! (Find out where you can get kohlrabi on Real Time Farms here). Kohlrabi is a member of the cabbage family, it has a texture similar to broccoli stem crossed with a slightly spicy turnip and a crisp juicy apple (only not as sweet). It is roundish in shape (look for bulbs around the size of a tennis ball or smaller), should generally be peeled before using, and can either be eaten raw or cooked. We used two kolhrabis (top center of the photo below) for a delicious team lunch of veggie slaw inspired by a recipe given to Cara by a member of the Tantre Farm team. 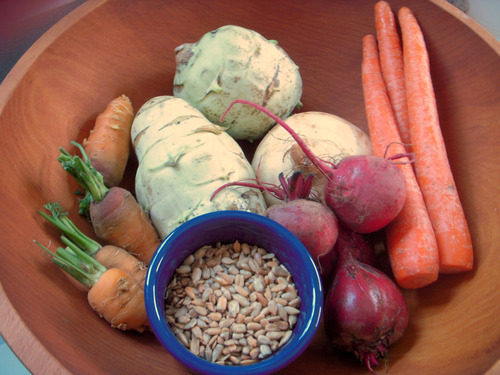 As you can see, we used 4 small carrots, 3 larger carrots, 2 kolhrabis, 1 turnip, 4 small candy-striped beets, and a generous handful or two of roasted, salted sunflower seeds. Cara and Karl picked up all of these veggies from vendors at the Ann Arbor Farmers Market, but you can search for all of these veggies and more here! 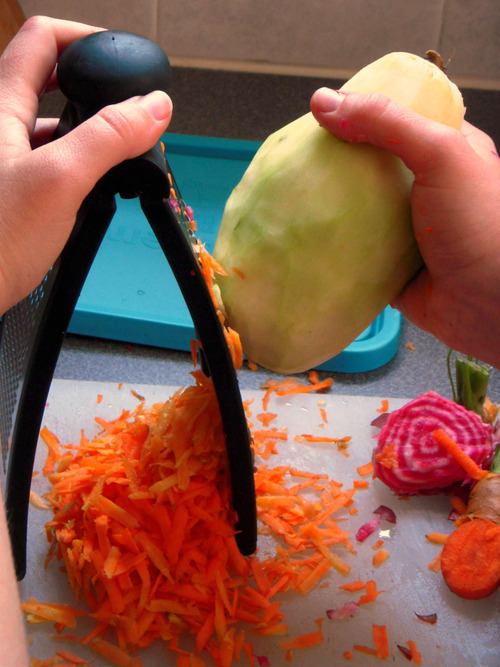 Grate all of the veggies on the large side of a box grater (or with a julienne attachment on your mandoline or food processor), or just chop up all of the veggies into little matchsticks. Toss the grated veggies with a light dressing of olive oil, lemon juice, balsamic vinegar, sea salt, and freshly ground pepper, and then fold in the sunflower seeds. 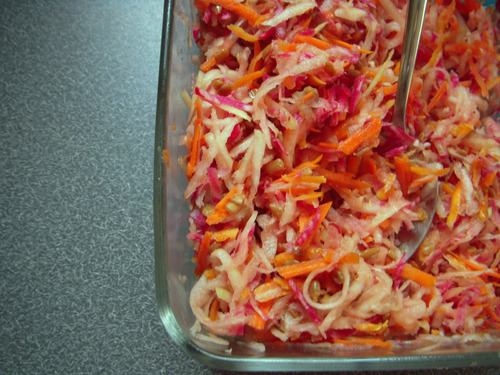 Spoon some slaw into a bowl, eat, enjoy, and soon you’ll be saying Holy Kohlrabi too!! This entry was posted in In the Kitchen (recipes & more) and tagged beets, kohlrabi, lindsay jean hard, local food, Real Time Farms, turnip. Bookmark the permalink.